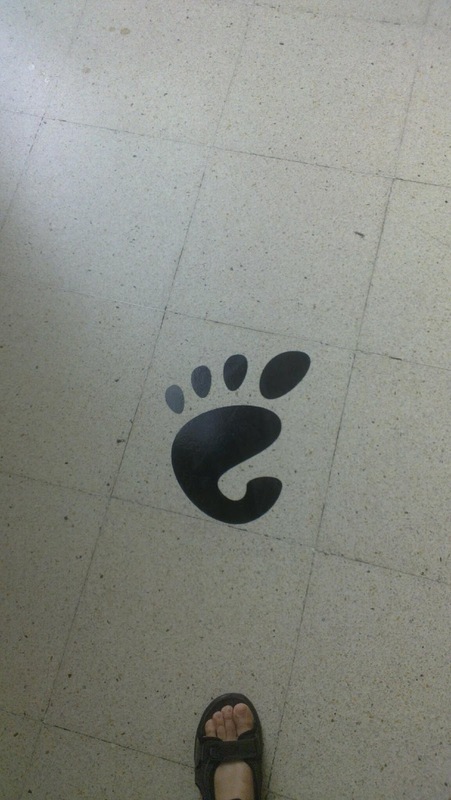 I was at GUADEC last week like many other cool gnomies. It was a lot of fun, just like very year but I believe this was one of the best, especially how it was organised. 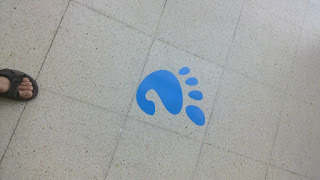 The feet marks on the floor were was just an awesome touch that kept on reminding us everyday that good conferences are a result of a lot of hard work. Seems its slowly becoming a tradition of mine since last year for me to stay at one of the organiser's house. :) Last time, I stayed with Lennart for the noncore days and this time I stayed all the days with Xabier and Laura. While they were very busy with their organising duties at the conf, they at the same time did an awesome job as my hosts. 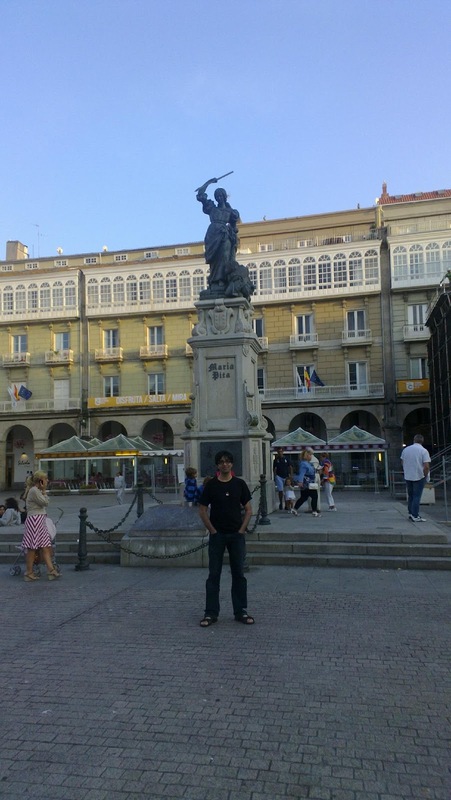 Xabier made sure that I don't have any problems what so ever and that I get to eat the best food in town and have a lot of fun. On top of all that, he woke-up 5:15 AM to drive me to airport. TBH I feel pretty bad now, knowing that I can't possibly return the favor. :( Thanks so much Xabier and Laura. You guys are awesome! 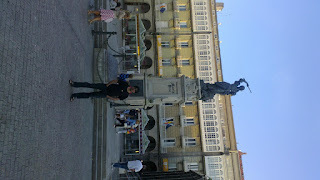 A Coruña is a very nice little town: people, beaches, history, culture, food etc etc. When it was combined with a lot of fun people from all over the world, it was like being in heaven. That said, there was one thing that was a bit of an unpleasent surprise for me: it gets really chilly at nights. Since I wasn't prepared for that, I wore shorts even in the evening and ended-up catching a cold. Later it turned into a fever. Fortunately, Xabier was there to take very good care of me and even took me to a doctor. He actually had to insist on that as I'm usually too lazy for that. I got much better before flying back but I still haven't completely recovered. Coughing like crazy.. There were many great talks but my favorite one was "PiTiVi and the GES: state of the onion" from Jean-François (AKA Jeff) . I was actually on my way to another talk that was scheduled at the same time but I caught a glimpse of his "slides" from the door and couldn't resist checking it out first. Once I got into the room, it was hard to leave. Awesome job Jeff! Out of pure coincidence, I was having some problems with Pitivi while working on my slides so I was directed to Jeff by people who knew him. Turned out that Jeff was having trouble with Boxes not working for him so we both helped each other out. In the end, our problem was quite the same: We were both trying to do something that was posible with Pitivi/Boxes. :) My second favorite was "The History of GNOME" keynote from Federico, Jonathan and David. It was nice to hear the inside story of early days of GNOME development, how some of the core GNOME hackers used too look like back in the days and the screenshots shown brought back many good memories from my early use of GNOME (think several hours wasted on playing with hide/unhide buttons on the panel). My Boxes talk went OK'ish. Everything else went fine (even the demos, something that hardly ever work for me) except for the videos. I never included videos in my talk before so I wasn't very prepared to prepare for it. Lame excuse, I know. Talking of Boxes, Christophe arranged a meeting between all the Boxes and SPICE developers present at the conf with our designers, Jakub and Jon. We gathered very usel feedback from them and they noted down some action points for themsevles to come up with mockups for some usecases/issues not yet covered. Talking of Jakub, it was nice to meet him outside Battlefield arena for a change. :) Well, I've had the pleasure of meeting him in person before but we weren't really close friends until 6 months ago when I joined him and his Czech and Polish friends in their Battlefield addiction sessions. Then there was the GNOME OS BoF. I think that also went very nicely. 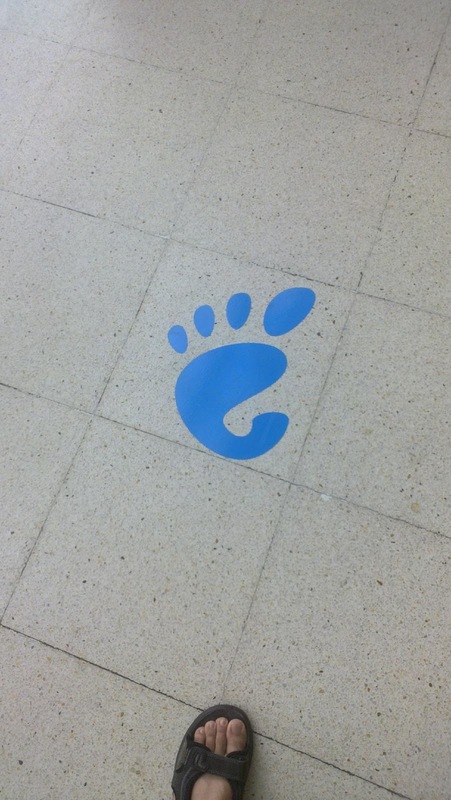 It took most of the day but we now have a much more concrete idea of what GNOME OS is all about or going to be. A lot of what, why, how and who was discussed thoroughly. The most important thing was that everyone agreed to go forward with the idea and its no longer just some vague thought up in the air. Hopefully there will soon be documentation and mailing-list about it too (we already got an IRC channel). Last but not the least, it was a pleasure to meet many new contributors, mainly the GSoC and OPW students. Its great seeing our outreach program working so succesfully. Kudos to everyone involved, especially Marina. AFAICT both students working on Boxes-related projects, Fabiano and Jovanka took full advantage of their presence at GUADEC and hopefully will be able to completele their projects in time.